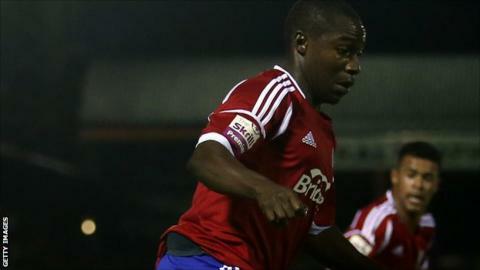 Aldershot bolstered their survival chances with a shock away win over play-off chasers Alfreton. The Shots doubled their advantage when Mark Phillips headed home Mark Molesley's cross before John Akinde pulled one back for the hosts. Manny Oyeleke's neat finish from close range made it 3-1 and Molesley sealed it with a low drive from 18 yards. The result means Aldershot are one point from safety while Alfreton are a point off the play-off places. "You've got two teams in different scenarios. One needing points to get into the play-offs and one wanting to stay up. "If I say they wanted it more than us, that might be a little bit harsh, because I do believe that our players do want it. "But to give them some credit, they've come here and shown they are a good side and I'm sure they wouldn't be where they were if they played like that every week." "Absolutely outstanding from minute one. There was a real belief that I think everybody saw we had a determination and belief to win the game. There was a real togetherness, and we knew we could have score more goals. "We kept going and that's what we wanted but we had to move the ball well to do that and it all came together lovely. It was a really good team performance, where everyone played their part. "We were taking their midfield players out of the game with Stanley and Oyeleke dominating their midfield pair. We looked very comfortable going forward and Molesley scored a really good goal and it was coming thick and fast." Match ends, Alfreton Town 1, Aldershot Town 4. Second Half ends, Alfreton Town 1, Aldershot Town 4. Foul by Bradley Bubb (Aldershot Town). Offside, Aldershot Town. Bradley Bubb tries a through ball, but Bradley Bubb is caught offside. Craig Stanley (Aldershot Town) wins a free kick. Substitution, Aldershot Town. Bradley Bubb replaces Martin Rowlands. Martin Rowlands (Aldershot Town) is shown the yellow card for a bad foul. Foul by Martin Rowlands (Aldershot Town). Shaun Harrad (Alfreton Town) wins a free kick. Attempt missed. Nick Fenton (Alfreton Town) header from the centre of the box is too high. Assisted by Josh Law. Attempt blocked. Shaun Harrad (Alfreton Town) right footed shot from the centre of the box is blocked. Attempt missed. Craig Stanley (Aldershot Town) right footed shot from the centre of the box is too high. Assisted by Josh Scott with a cross. Substitution, Alfreton Town. Shaun Harrad replaces Godfrey Poku. Attempt missed. Bradley Wood (Alfreton Town) right footed shot from outside the box misses to the right. Goal! Alfreton Town 1, Aldershot Town 4. Mark Molesley (Aldershot Town) right footed shot from the left side of the box to the bottom left corner. Foul by Nick Fenton (Alfreton Town). Attempt missed. Daniel Bradley (Alfreton Town) right footed shot from outside the box misses to the left. Attempt missed. Mark Molesley (Aldershot Town) right footed shot from outside the box misses to the left. Attempt blocked. Nick Fenton (Alfreton Town) header from the centre of the box is blocked. Assisted by Josh Law. Goal! Alfreton Town 1, Aldershot Town 3. Manny Oyeleke (Aldershot Town) right footed shot from the centre of the box to the bottom right corner. Assisted by Mark Molesley with a cross. Goal! Alfreton Town 1, Aldershot Town 2. John Akinde (Alfreton Town) left footed shot from the left side of the six yard box to the centre of the goal. Assisted by Josh Law with a cross. Danny Meadows (Alfreton Town) hits the bar with a right footed shot from outside the box. Attempt missed. Adam Mekki (Aldershot Town) right footed shot from outside the box misses to the right. Attempt missed. Josh Law (Alfreton Town) right footed shot from outside the box misses to the right from a direct free kick.